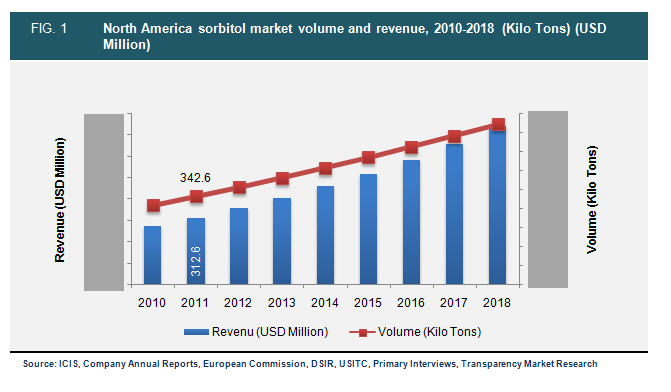 The growing awareness regarding health concerns, particularly in the context of using healthier alternatives to sugar, is a key driver boosting the sorbitol market. Sorbitol is a basic raw material required in the production of surfactants and Vitamin C. As compared to other dietary sugars, sorbitol is a metabolized slowly. The use of sorbitol is increasing in the global market because it is being explored as a base chemical for production of propylene glycols, ethylene glycols, and glycerols – all predominantly derived from petrochemicals. The product base in the sorbitol market is almost the same as other polyols and isosorbides. Such an increasing application scope for isosorbides and polyols has resulted in a high potential for sorbitol market. The study also analyzes various sorbitol product forms that include crystal and liquid. Liquid sorbitol is mainly manufactured based on numerous processes such as purification of dextrose, hydrogenation, and purification. Crystal sorbitol, on the other hand, is obtained after spray-drying, incurring extra cost. Liquid sorbitol accounted for 83.3% of the overall demand in 2011 and continues to dominate the global sorbitol product segments. Similarly, toothpaste, diabetic and dietetic F and B, Vitamin C, and surfactants are some of the key applications within the global sorbitol market. Diabetic and dietetic F and B and toothpaste accounted for 23.6% and 21.3% of the overall demand in 2011, respectively. As sorbitol is less sweet in comparison to other sugar alcohols, this market finds growing applications in various industry verticals including pharmaceutical, food & beverage, cosmetic and personal care, and the chemical industry. It is the relatively low sweetness in sorbitol that makes it a preferential choice among several diabetic patients across the globe. The rising diabetic and dietetic population is primarily boosting the market growth of sorbitol. Sorbitol allows the diabetic population to enjoy the sweetness of sugar and control their weight and other dietary illnesses. Hence, increasing sorbitol application as a low-calorie sweetener is expected to boost the global demand for sorbitol over the next five years. Excessive sweetness creates dental problems and that is precisely why sorbitol is preferred to sugar, as it inhibits the formation of acids in the mouth that results in dental cavities. However, the global sorbitol market is restrained by variable raw material prices and side effects caused by sorbitol upon excessive consumption. In terms of consumption, North America and Europe dominated the global sorbitol market in the earlier stages. The European sorbitol market is expected to grow at a rapid CAGR of 12.5% from 2012 to 2018. Demand for sorbitol soars in Asia-Pacific as well. The Asia Pacific sorbitol demand is mainly dominated by four regions including India, Indonesia, China, and Japan.